The new Batman of Earth 2 finally makes his debut in this months Earth 2 annual #1, while the World Army gears up to confront the return of Steppenwolf from his stronghold in Dherain. James Robinson draws together many ongoing plot threads, setting the stage for the next challenge the New Wonders of Earth 2 must face. Following a lead that takes him to Cambodia, the Atom goes undercover in Phnom Penh to find a war criminal, Henri Roy, who runs a lucrative black market operation dealing in high-tech weaponry and cybernetic enhancements. The Atom allows himself to be captured so he can get to Henri Rory, unaware that a new Batman is watching from the shadows. As soon as Captain Pratt turns into the Atom he is attacked by the bodyguards, and then Henri Roy himself, after he dons a battle suit. 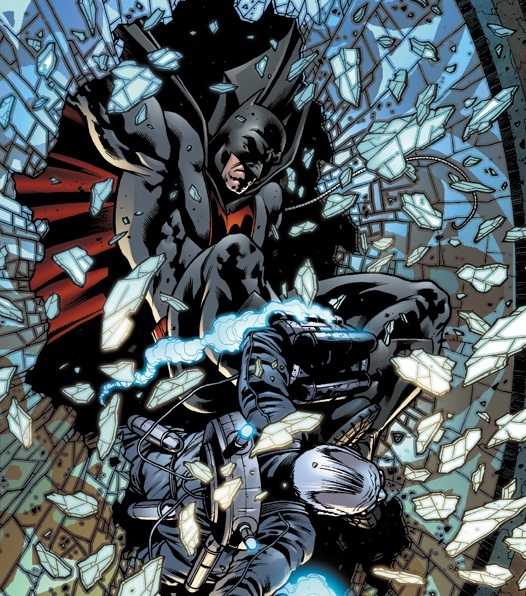 The Atom manages to defeat and capture Henri Roy, with some unexpected help from Batman, before meeting up with Major Sonia Sato. It turns out that the war criminals son, Henri Roy Jr, was the one who told them where his father was. He decides to join the World Army, in an attempt to make up for what his father has done, and to find an explanation for the terrible headaches that he used to suffer from. Major Sato then informs the Atom that Steppenwolf is now the ruler of Dherain. After a short interlude on the Sentinel (The World Army Central Intelligence Hub) where Commander Khan sends Captain Steel to investigate one of the fire pits caused by Sloan in Rio, we rejoin the Batman as he fights Mr Icicle in Colmenar Viejo, Spain. The new Batman of Earth 2 is hunting a being known as Kanto, the Assassin of Apokolips, who helped enhance humans like Mr Icicle during the Apokolips War. Batman has learned that Kanto is calling in his markers to those he empowered, intending to uses them in some new plan he is devising. After dealing with Mr Icicle and questioning him, Batman decides its time for him to find out more about Hawkgirl. Over in the ruins of Gotham City, where the world once reeled from the fiery wrath of the Agonists, mutated monsters now roam this desolate place. It is here that Mr Miracle and Barda have been since they escaped from Steppenwolf. They are searching for the mysterious new Batman and the cave he reportedly dwells in. Mr Miracle is worried that the time Barda has spent hunting mutants could have revealed their location to the World Army, he want to move on, but before they can act Barda is suddenly attacked by Fury. 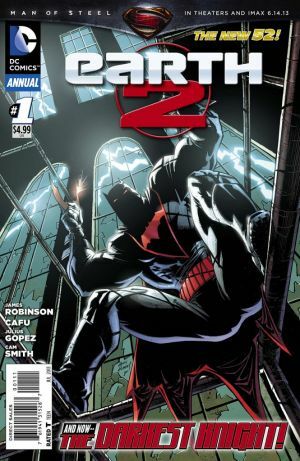 Earth 2 annual #1 is another great instalment of Earth 2 by James Robinson. As well as introducing the new Batman, the spotlight initially falls on the Atom and his secret mission to Phnom Penh. We get a much greater insight into the character of Captain Pratt, as he recalls events leading up to the nuclear explosion that created him, as well as having to come to terms with being the only survivor from his platoon and his new found powers. The artwork for Earth 2 annual #1 is shared by Cafu and Julis Gopez, with Cafu and Cam Smith on inks, and Pete Pantazis on colours. Their work on this first Earth 2 annual is excellent, especially during the scenes where Captain Pratt reflects on the past, and the moment where he becomes the giant sized Atom and pursues Henri Roy’s robotic suit across the rooftops. It was also good to see many of the supporting characters again, including Commander Khan and Major Sato, as well as introducing Captain Steel and the new subplot involving the fire pits. We also get to see Mr Miracle and Barda exploring the ruins of Gotham City, before they are attacked by Fury who has been sent by Steppenwolf to find them. The hype surrounding the new Batman has helped build expectations for Earth 2 annual #1, and the cover by Andy Kubert and Brad Anderson is really striking. While most of the plot is actually centred around the Atom and his mission, when the new Batman does appear, it’s done with incredible style. He swoops in to take out the reinforcements attacking the Atom, before sneaking back into the shadows, where he listens in on the news that Steppenwolf has announced his presence in Dherian. We then follow Batman as he searches for information about Kanto, the Assassin of Apokolips, and fights one of the augmented humans he created in the war, Mr Icicle. The identity of the new Batman remains a mystery for now, his search for Kanto will no doubt bring him into contact with the rest of the New Wonders of Earth 2 soon enough, and I look forward to seeing how his story develops in the main series. Sadly writer James Robinson has announced that he is leaving Earth 2 as of issue #16, and will no longer be working for DC Comics. This news came as something of a shock to fans of the series, and his successor will certainly have a lot to live up to. Despite the news of Robinson’s departure, Earth 2 annual #1 is still an exciting issue, full of intense action and it sets up terrific a closing scene that will be continued next week in Earth 2 #13. The final issue of The Fury of Firestorm the Nuclear Man begins with General Eiling monitoring events near the warehouse in Pittsburgh, where Firestorm had been beaten to within an inch of his life by Multiplex, Hyena, Killer Frost, Black Bison, Typhoon, and Plastique. As he prepares to issue more orders to his special operative in Pittsburgh, the General receives a very special visitor, and its someone who wont take no for an answer. 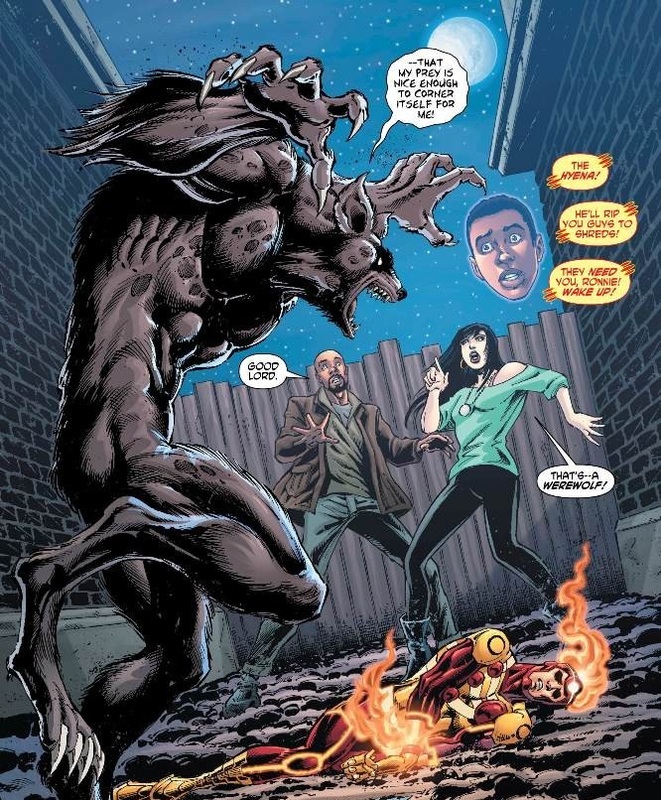 With Firestorm unconscious Jason’s dad and Tonya have to drag him to the safety of an alley, but Hyena suddenly leaps from the shadows and attacks them. 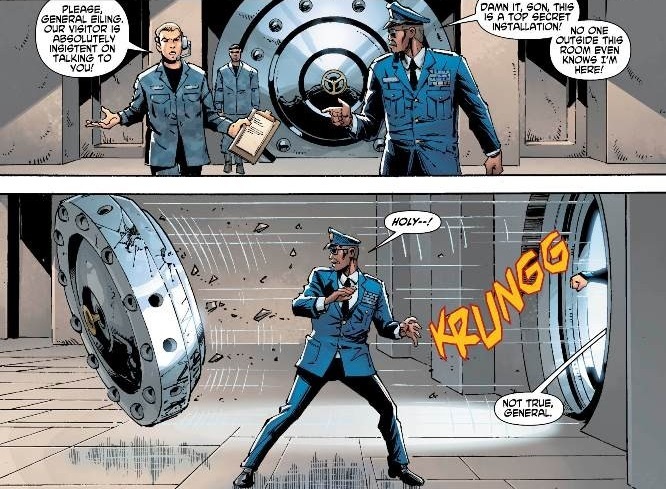 Fortunately for Al and Tonya the General’s operative, Major Force, is on hand to deal with Hyena and give Firestorm enough time to recover from the explosion. After a few quick introductions Firestorm and Major Force are attacked by Killer Frost and Black Bison. Major Force holds off Killer Frost and Black Bison while Firestorm leaves to rescue Ronnie’s mother, who is still being held captive by Plastique at the dockside. Typhoon attempts to stop Firestorm by engulfing him with a tidal wave, but Firestorm makes the water boil and defeats him. 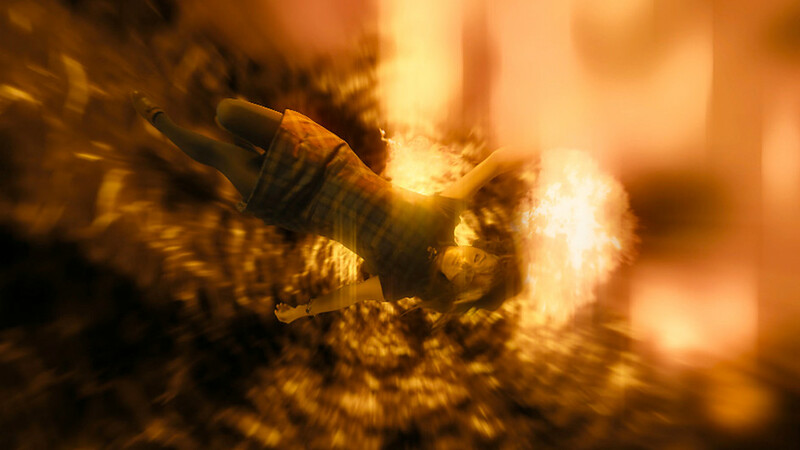 As Firestorm rushes to save Ronnie’s mother, Al sneaks up on Plastique and knocks her out to rescue Joanne. With everyone safe, Firestorm rushes to help Major Force, who has been knocked out and frozen in ice. Firestorm smashes the ice and frees Major Force, who takes out Black Bison while Firestorm uses his transmutation powers to trap Killer Frost in the concrete pavement. He then faces Multiplex who threatens Firestorm’s family before fading away, warning him not to try and follow him. Major Force arrives and renders Firestorm unconscious with a Neural Shock so he can take him to General Eiling at the military base. Firestorm recovers as the General’s guests arrive, Superman and Professor Stein, who are here to stop the militaries plans for Firestorm. It seems that Professor Stein faked his own death to escape his enemies, now he has returned to help Firestorm by contacting Superman and the Justice League. Danger strikes when Hyena suddenly leaps from the shadows and attacks! This incredible final issue brings Dan Jurgen’s brilliant run on Firestorm to an end. With a story featuring nearly every member of Firestorm’s rogues gallery, we really get a sense of how well Ronnie and Jason work together now, and see just how vital a role their parents, Al and Joanne, and Tonya have to play in helping him. There are some wonderful scenes after Joanne is rescued by Al, where Ronnie and Jason have to assure both of them that he is ok, and that he has to return to help Major Force to deal with Multiplex and his allies. Dan Jurgens art for Firestorm #20 is as spectacular as ever, the intense action is inked by Norman Rapmund, along with Hi-Fi’s vivid colours, and lettering provided by Travis Lanham, each explosive set-piece is perfectly intercut with some great personal moments between Firestorm and his parents. 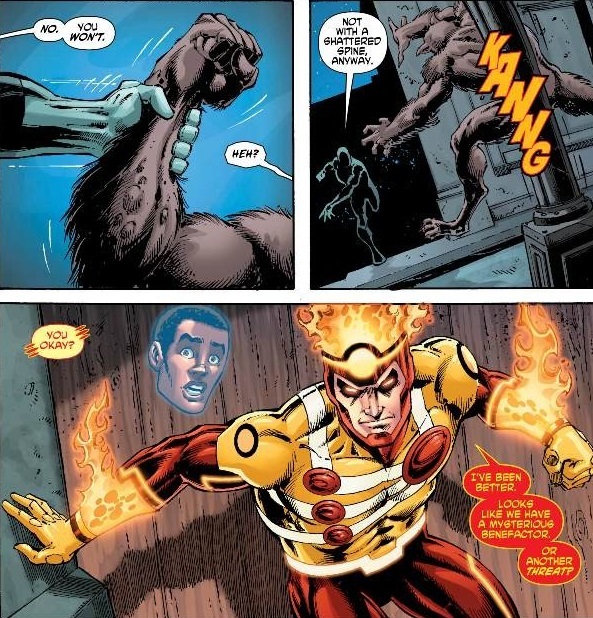 Every one of Firestorm’s enemies also gets showcased in Firestorm #20, with their unique powers and abilities being creatively used. It’s also interesting to see how quickly Ronnie and Jason are now able to formulate strategies against each individual threat, tailoring their abilities, and using their unique shared conspicuousness to outwit their enemies. The General receives a very special visitor who wont take no for an answer! There is a fantastic scene where Superman takes out Major Force with just a flick of his finger that really puts General Eiling in his place. It was a real surprise to see Professor Stein return as well, having faked his own death to escape from his enemies. With this final issue Dan Jurgens has really excelled himself, by brining Professor Stein back into the fold; it offers a wealth of potential for the future. As we watch Firestorm and Superman fly away into the distance, this great moment is tinged with sadness, but I am really pleased that the series has ended on such a positive note. Firestorm returned in September 2011 as part of The New 52 reboot of the DC Universe, it was co-written by Gail Simone and Ethan Van Sciver, with art by Yildiray Cinar. The immense power of Firestorm was divided between physics student Jason Rusch, who acquired the ability to transmute matter, while the football team’s quarterback Ronnie Raymond was able to throw flaming bolts of nuclear energy. After Simone and Sciver left the title Joe Harris took over, resolving the ongoing storylines involving Rogue Firestorms, before the Zero issue of Firestorm brought Harris and Cinar’s run to an end as Firestorm became a fused entity again. The Fury of Firestorm The Nuclear Man took an entirely new direction when Dan Jurgens took over as the new writer / artist for the series, recapturing the essence of fun and adventure that was welcomed by fans of Firestorm as it brought the series closer to the original premise created by Gerry Conway and Al Milgron during the 70’s. As Firestorm continued to learn about his powers, with Ronnie providing the brawn and Jason advising him from within their shared conspicuousness, Dan Jurgens also had the chance to develop the supporting cast. 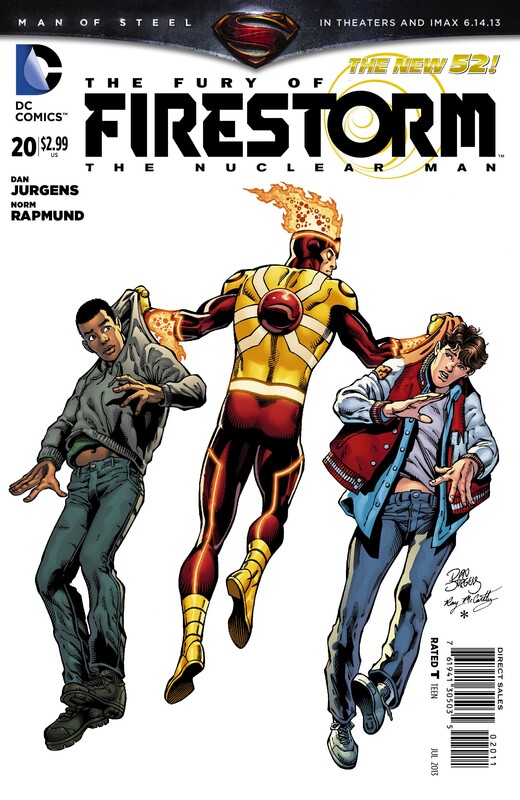 Dan Jurgens assembled a great team to work with him on Firestorm: with inks by Ray McCarthy and Karl Kesel, Hi-Fi’s colours, and lettering by Travis Lanham, the explosive action set-pieces that graced the pages of Firestorm were perfectly complemented by Ronnie and Jason’s everyday lives as high school students. The news that Firestorm was going to be cancelled came as something of a shock. 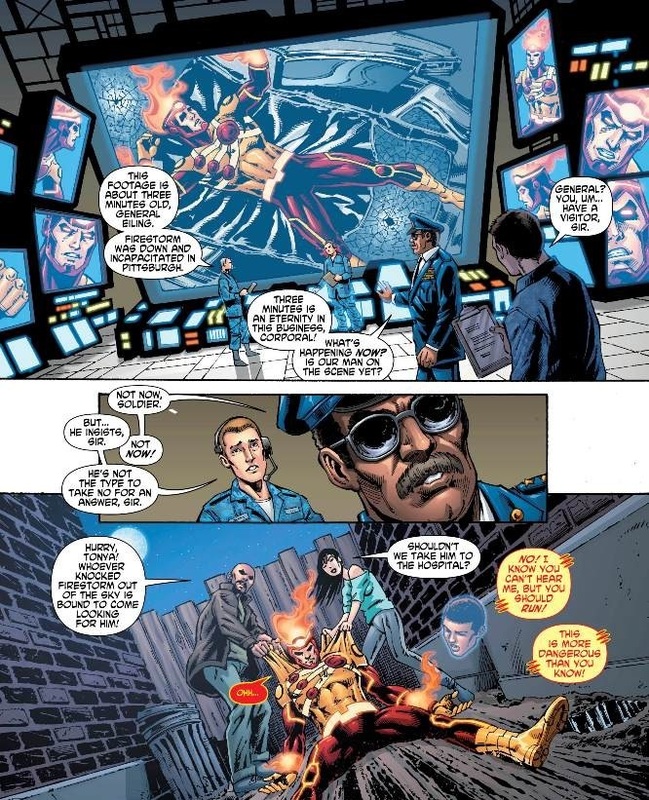 Although sales were not still not as good as was hoped, Firestorm still had a very loyal fan base that had supported the title since it debuted at part of The New 52. Fortunately we have Dan Jurgens and his team to thank for taking Firestorm in a new direction, thereby raising the characters profile in the New 52 DCU, with Captain Atom and the Teen Titans guest staring in his own title while Firestorm went on to appear in the Throne of Atlantis crossover event as a reserve member of the Justice League. 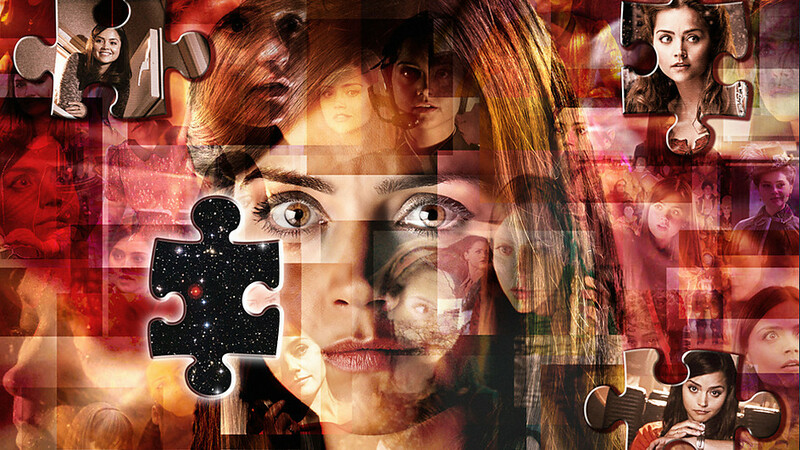 To mark the final issue of Firestorm many fans have taken part in an event organised by The Firestrom Fan Website (After the idea was suggested by Keith G. Baker and Hector Negrete), where fans changed their social media avatars to say goodbye to Firestorm’s ongoing series and show their support across various social media platforms. 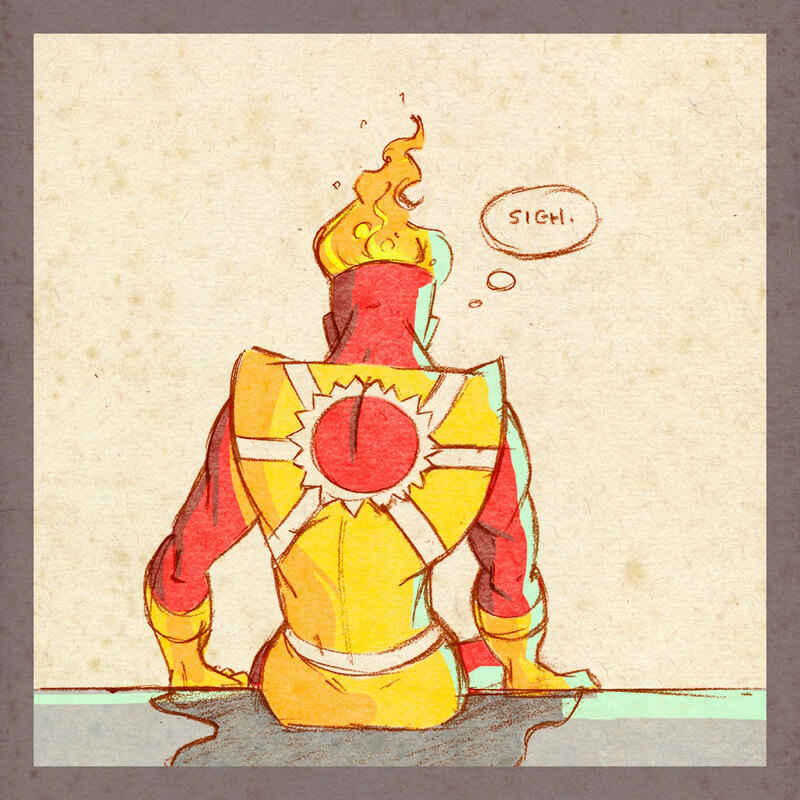 Those participating used a brilliant drawing of Firestorm provided by Luke Dabb , which summed up how many fans felt about the cancellation, using it as their avatar on Facebook, Twitter, Google Plus, Printrest, and Blogs along with hash tags and comments including #FirestormFarewell in their tweets and messages. By changing their Social Media avatars in this way fans wanted to show how much Firestorm means to them, and to celebrate the fantastic work done by everyone who has been involved on the title to ensure that Firestorm ends on a high. The flame may have flickered slightly, but it will never die. It’s been brilliant to see Firestorm appearing in so many comics over the last few months, and I’m really looking forward to seeing even more of Firestorm’s adventures with the Justice League. I’ve had tremendous fun reviewing Firestorm and sincerely believe that he will have his own title again one day. You can also keep up to date with all things Firestorm over at Firestrom Fan , and enjoy the Fire and Water Podcast made by Firestrom Fan and Aquaman Shrine, it’s a brilliant podcast and I urge all of you all to go and give it a listen and check out their twitter pages and websites. Finally I’d just like to thank all the readers of Sci-Fi Jubilee who have also enjoyed reading Firestorm with me and shared my reviews, be sure to support Firestorm over in Justice League #20 as well, cheers everyone! After rebooting the floundering Star Trek franchise in 2009, JJ Abrams boldly inventive revamp was a box office smash. With its all new cast of young officers and just the right balance of action and adventure, Abrams crafted an entirely new version of Star Trek, while remaining true to the legacy of the original series and its iconic characters. For the sequel, Star Trek Into Darkness, director JJ Abrams returns along with the principle cast in a film bursting with eye popping special effects and spectacular actions sequences. When their mission to stop a volcano erupting on a distant planet causes Captain James T Kirk (Chris Pine) to disobey regulations, Kirk ends up being stripped of his command. Forced to serve under his old mentor, Rear Admiral Christopher Pike (Bruce Greenwood), it looks like there is no way back for Kirk this time. But when Starfleet is left reeling from a terrorist attacks on London and San Francisco, by John Harrison (Benedict Cumberbatch), Kirk is reinstated by Admiral Marcus (Peter Weller). Kirk is soon back on the Enterprise, along with first officer Spock (Zachary Quinto), communications officer Uhura (Zoe Saldana), navigator Pavel Chekov (Anton Yelchin), chief medical officer Dr Leonard McCoy (Karl Urban), chief engineer Montgomer Scott (Simon Pegg), helmsman Sulu (John Cho), and newcomer Dr Carol Marcus (Alice Eve). Captain Kirk and his crew set out to track down the mysterious Harrison deep inside Klingon territory, with orders to deal with the threat. But when they discover who Harrison really is the crew of the Enterprise must face their greatest challenge yet, outgunned and facing impossible odds, they must succeed at any cost. 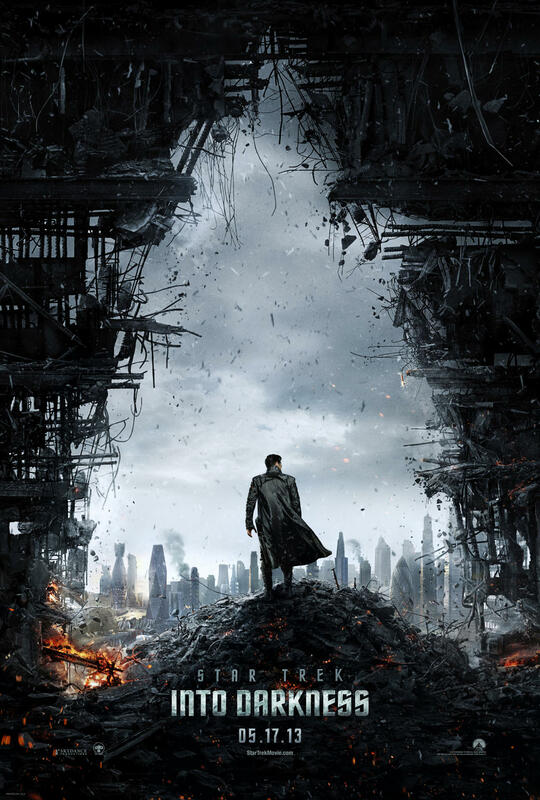 With its great ensemble cast and exciting plot, Star Trek Into Darkness is a resounding success on all levels. 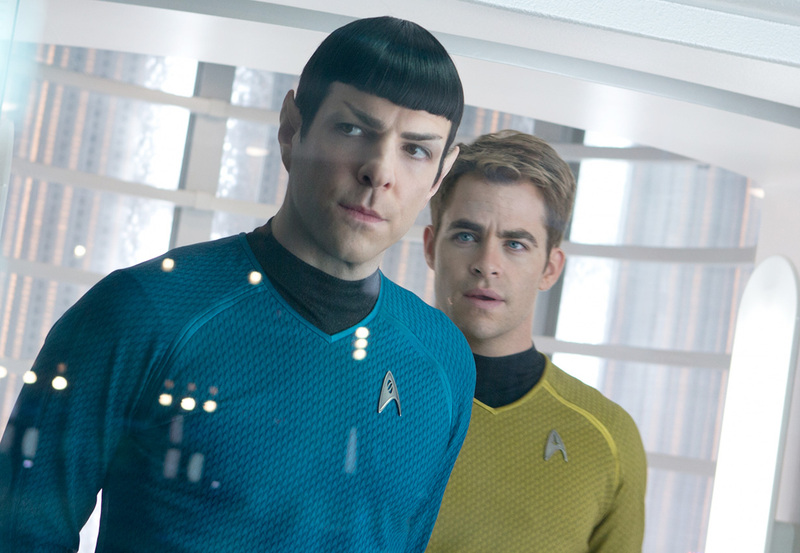 The friendship between the hot headed Captain Kirk and the logical half human Spock is really put to the test in Star Trek Into Darkness, as they face a crisis of confidence, with Chris Pine and Zachary Quinto both giving terrific performances. Spock’s relationship with Uhura also brings an added dimension to the character, while Kirk sets his sights on new Science Officer Dr Carol Marcus. Karl Urban plays a crucial role as Dr Leonard “Bones” McCoy, John Cho’s helmsman Sulu gets right in the thick of the action, along with Anton Yelchn’s Chekov, and Simon Pegg is on brilliant form chief engineer Scotty. Benedict Cuumberbatch is fantastic as John Harrison, exuding a palpable menace in every scene; he poses a far more credible threat to Kirk and the Enterprise than Eric Bana’s aggrieved Romulan from the first film. As Starfleet reels from the wrath of Harrison’s attacks, the stage is set for some epic confrontations between Kirk and his deadly adversary, and fans will savour every moment as Harrison’s back story gradually unfolds. 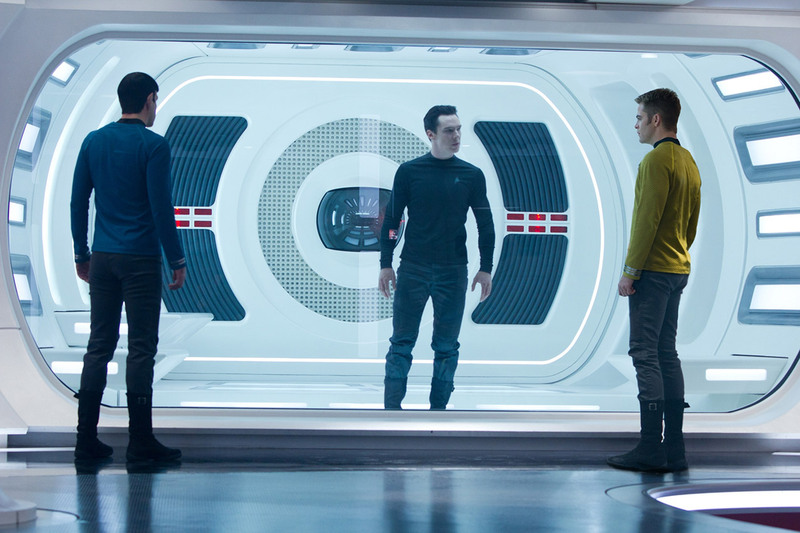 The trio of writers on Star Trek Into Darkness are headed by Robert Orci and Alex Kurtzman, who wrote the first film, and co author of Prometheus and the television series Lost, Damon Lindelof. The plot of this highly anticipated sequel is full of references to old Star Trek episodes and characters, and the nostalgic tone sits perfectly within the warp core of this rebooted franchise. Star Trek Into Darkness is directed with copious amounts of lens by flare by JJ Abrams that gleams across all the brilliantly orchestrated set-pieces: featuring exotic alien planets, a thrilling jump into an erupting volcano, phaser fights, a stunning jetpack ride, and with plenty of jaw dropping action for the USS Enterprise to keep you on the edge of your seat. 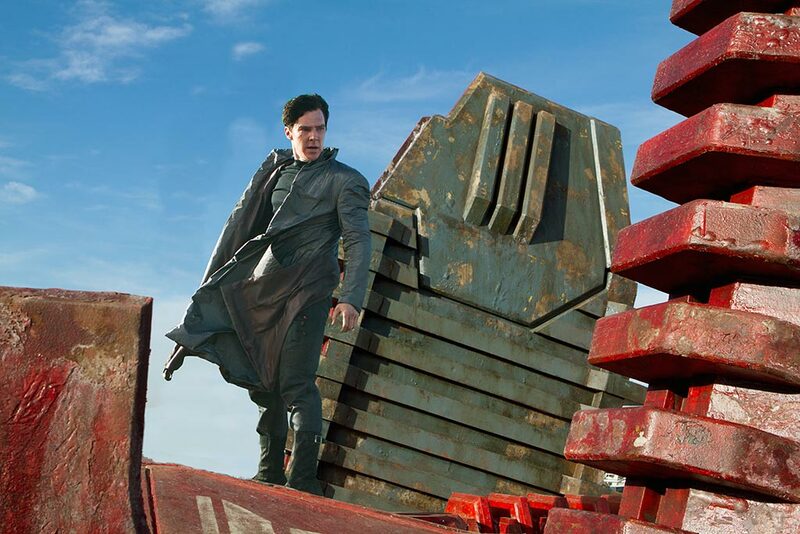 Star Trek Into Darkness takes this reinvigorated franchise to even greater heights. 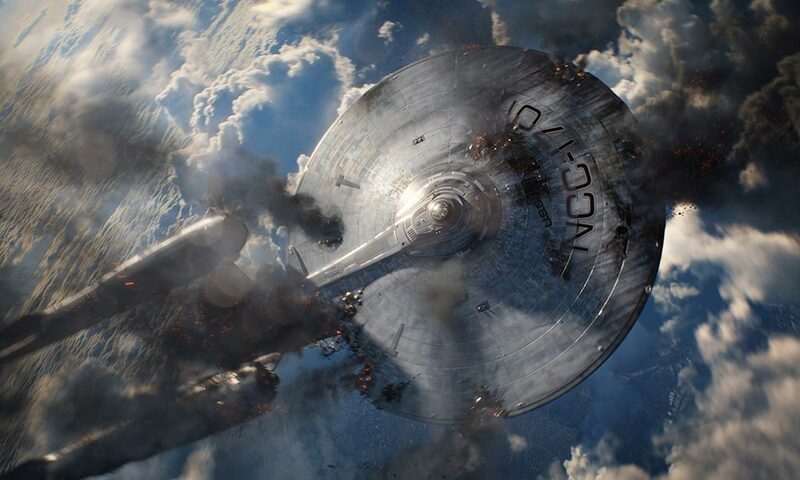 Filled with spellbinding action, great character moments, humour, and plenty of nods to the past for fans, Star Trek Into Darkness will leave you eagerly awaiting next voyage of the Starship Enterprise as her crew set out to boldly go once more. Jesus arrives back at the Hilltop community in a bid to recruit people for the imminent battle with Negan and the Savours. Their leader, Gregory, is weary of the plan, but Maggie and guardsman Kal are the first to pledge their allegiance. As support begins to grow Jesus discovers that Kal has left the Hilltop. Fearing that Kal is going to betray them all, Jesus goes after him before he can reach the Saviors camp and reveal their plans. The Walking Dead #110 sees Jesus in a desperate race against time to stop Kal from talking to the Saviors. Fortunately for everyone Jesus manages to catch up with Kal at the crossroads just as the Saviors arrive. He stops him talking to them, managing to defuse the situation, but takes a beating from one of Negan’s men in the process for wasting their time. After addressing some of Eugene’s concerns about using the ammunition he’s making in the war against the Savoirs, the time has come for Rick to introduce his friends to Ezekiel. 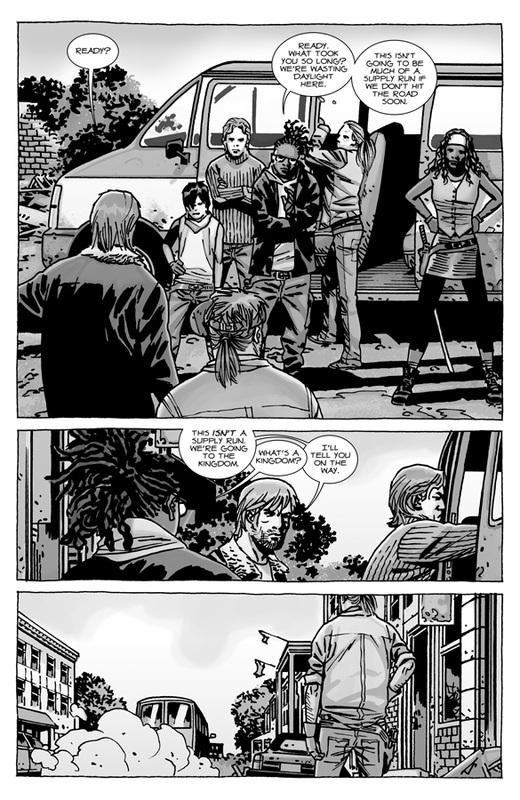 Rick gathers a small team together, including Carl, Michonne, and Andrea, to visit the Kingdom. The initial meeting between Ezekiel and Michonne ends with Shiva the tiger snarling angrily at her. A clash of swords with Ezekiel seems to break the ice between them, and later after dinner, the would be samurai and king seem to have a lot more in common than either of them first realized. 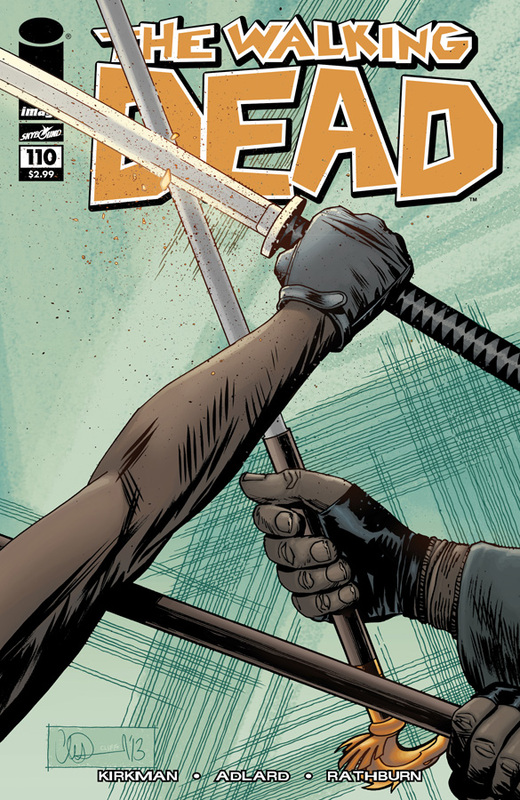 The Walking Dead #110 is another character driven piece by Robert Kirkman. I really like how Kirkman has taken time to develop so many new characters, especially King Ezekiel. The scenes between Ezekiel and Michonne are the real highlight this issues. In some ways they are like polar opposites of one another, later we learn how the ruler of the Kingdom was a zookeeper and discover how he saved Shiva the tiger. This touching story adds a further layer to Ezekiel’s character, we see him in a very different light, and as a consequence of this we also see another side to Michonne. Ezekiel’s observation, that the world they now inhabit has forced them both to assume roles that neither of them are really comfortable with, is a moment which lets us see behind the facade of both characters. The art by Charlie Adlard is as good as ever. With the cast seeming to grow every issue, I think its great how Charlie Adlard continues to make every character stand out; each one is clearly distinguishable from the other – even the minor players. While some might bemoan the lack of Walkers over the last few issues, I think it’s a good idea to get to know the ensemble cast. I’m sure the war with Negan and Saviors will lead to much bloodshed, with no quarter given and none taken as Rick and his new alliance strikes back as Negan. The Walking Dead #110 may be comparatively light on action but Robert Kirkman and Charlie Adlard continue to keep us on the edge of our seats as the tension builds. Its issues like this that makes The Walking Dead such an engrossing book to read, you really get to care about the characters, and the ever-present threat of the Walkers is always lurking in the background. Now that the stage is set, the success of Rick’s alliance with Ezekiel now depends on Dwight’s loyalty to their cause. The stakes have never been higher for Rick and his friends, soon the war will begin, and only the strongest will survive. Clayface has returned to Gotham City, embarking on a lucrative crime spree, using his powers to blackmail and terrorise his wealthy victims. While investigating the death of Brain Wayde, the architect developing the Gotham Initiative, Batman discovers that Wayde was murdered by Clayface. It seems that the magical properties of the clay that turned Basil Karlo into Clayface has mutated Karlo’s DNA. Clayface can now actually become the people he mimics, but his own DNA is gradually being corrupted by the clay. 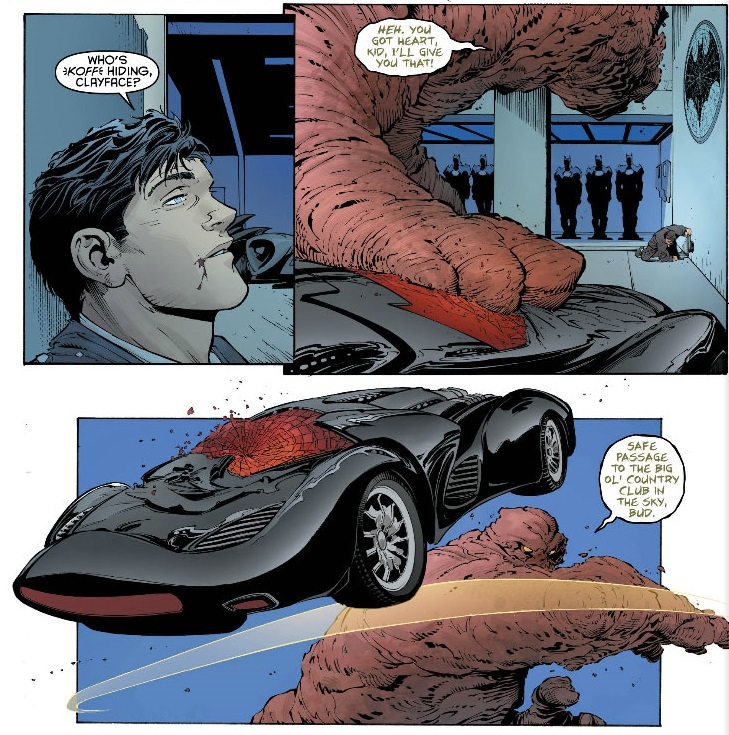 Bruce Wayne arranges to meet Lucius Fox at Wayne Enterprises, to order a protective suit for Batman, but he is shocked when Lucius transforms into Clayface and attack him. Cornered by Clayface in the Wayne Enterprises R & D Lab, Bruce Wayne is powerless to stop Clayface ransacking the armoury. 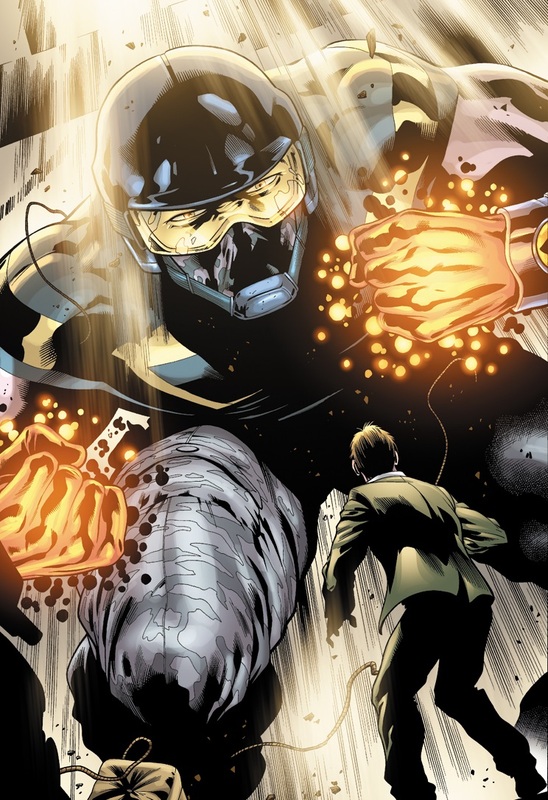 Bruce tries to use a squad of Bat-Bots to defend himself, but Clayface mimics Wayne’s voice and deactivates the robots. Clayface reveals how he killed Brian Wayde before capturing Bruce and throwing him into a crusher with Lucius. 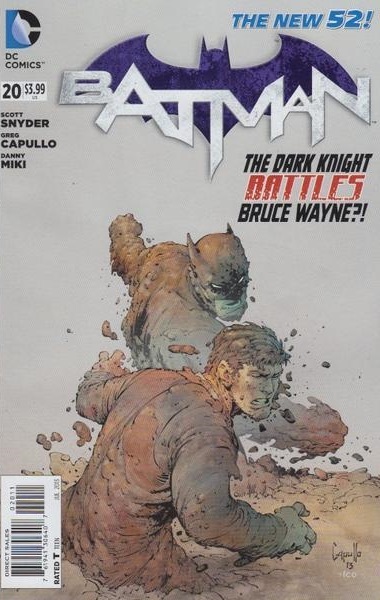 Batman #20 follows on from last issues brilliant cliff-hanger with Bruce Wayne in mortal danger as Clayface attacks him in the armoury at Wayne Enterprises. Scott Snyder and Greg Capullo have done a superb job of realising the full potential of Clayface; the way his powers have mutated makes him a deadly adversary. What is even more chilling is how Basil Karlo is losing himself in the identities of the people he duplicates. There are some terrific scenes of carnage in the R & D Lab, brilliant rendered by Greg Capullo’s art, with inks by Danny Miki and colours by FCO Plascencia. The raw power and strength of Clayface is terrifying to behold, as he tosses a Batmobile around like a toy. What is really disgusting though is how he swallows Bruce Wayne whole, drawing him into his body, before disgorging him later to dispose of him with Lucius in the compactor. As the walls of the compactor begin to close in on them, Bruce and Lucius search through the mangled pieces of equipment, where they find a prototype Bat-Suit amongst the discarded junk. Bruce puts on the red-winged Bat-Suit and uses it to get them out of the crusher. I never thought I’d ever see anything like a Star Wars Trash Compactor scene in a Batman comic, but this was fantastic. It was pure genius on Scott Snyder’s part to make the prototype Bat-Suit a clear homage to the animated Batman Beyond series, particularly when Lucius says how the armour is faulty and would take at least twenty years to fund and perfect. Scott Snyder ensures that Batman #20 dovetails nicely into the flash forward – where Bruce Wayne robbed a bank and shot Gordon – that opened the previous issue. The action never lets up for a moment as Clayface returns to Wayne Enterprises, where Batman confronts him wearing his new Bat-Suit with heavy epidermal protection. Batman uses every chemically based strategy in his arsenal against Clayface, but nothing seems to have much effect. Clayface begins to morph horrifically during the fight, taunting Batman with disembodied faces from his Rogues Gallery. 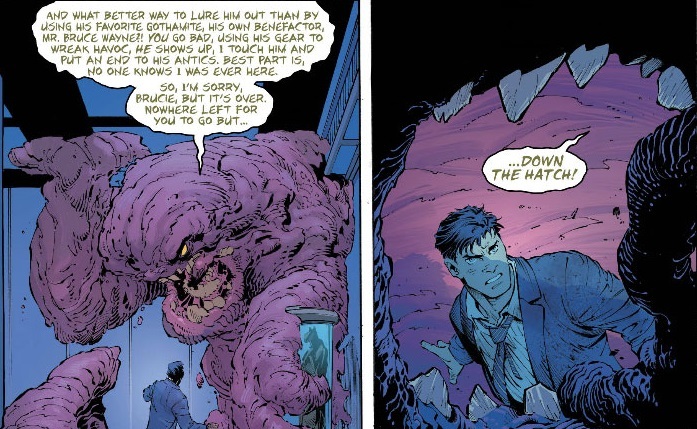 It’s very clever how Batman manages to trap Clayface in a panic chamber, using his own mutated DNA against him, to create the perfect cage for the shape shifting villain. Batman also manages to prevent his secret identity being revealed, although it does stretch credibility a little to think how close everyone is to knowing Bruce’s secret without even realizing it. This minor quibble aside, Batman #20 still manages to provide a highly emotional climax. After Clayface unwittingly taunts Batman from inside the panic chamber, he transforms into Damien Wayne, little knowing what a profound affect his distorted observations will have on the Dark Knight. Later in the Bat-Cave as Bruce discusses the case with Alfred, he admits how deeply Damien’s death has affected him, but that he is not losing himself in his grief like he did when Jason died. Alfred offers to sit with Bruce a while and they view the playback of Damien’s last mission with Batman against the Reaper using VR goggles. This poignant conclusion to a Requiem for Robin is all the more remarkable as it says so much by saying so little. The back up story by James Tynion IV and Alex Maleey sees Batman and Superman facing dark supernatural forces summoned by two teenagers in an old apartment block. Superman does his best to hold back the Will O’ The Wisp, but its magic weakens him. Batman approaches the spirit of Becca, who helped summon the demonic creature. With her help Batman finds a scrap of paper they used to summon the creature. Batman translates the Gallic writing and sends the creature back to its own dimension. Becca’s spirit gives Superman some sound advice, before slowly fading away. Ghost Lights has been a great supernatural adventure for Superman and Batman, and it also manages to address some of the issues Batman has over Damian’s death. Batman #20 is another thoroughly entertaining issue from Snyder and Capullo, and it leaves us eagerly awaiting the start of Zero Year next month. 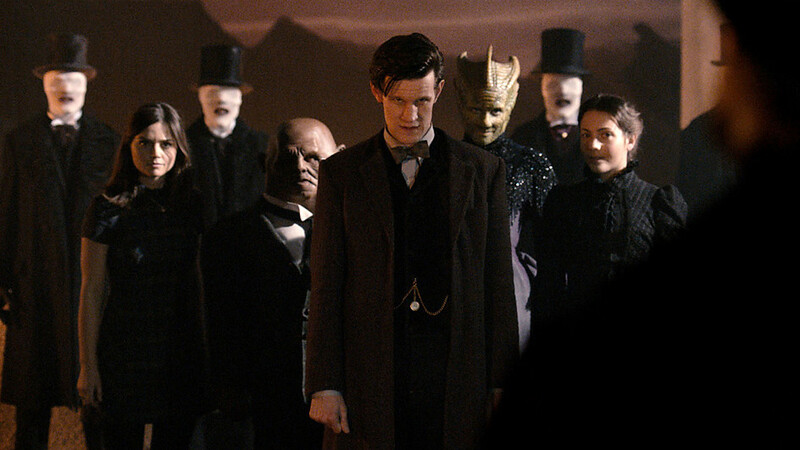 The Crimson Horror sees the Doctor (Matt Smith) and Clara (Jenna-Louise Coleman) teaming up with their old friends Madam Vastra (Neve McIntosh), Jenny (Catrin Stewart), and Strax (Dan Starky) to investigate Sweetvill in Yorkshire, 1890. It seems like an idyllic place, this enclosed factory community with its happy workforce, but ghastly secrets are concealed here and no one ever leaves. People have come to Sweetvill to work in the factory, where they are offered absolution from their sins, and protection against the imminent apocalypse foretold at The End of Days. While the streets may be spotlessly clean and the people beautiful, dead bodies covered in red wax are being washed up in the river, and a terrifying secret is brewing behind the doors of the Sweetville Mill run by Mrs Gillyflower (Dame Diana Rigg), along with her blind daughter Ada (Rachel Starling), and their mysterious business partner Mr Sweet. When the Doctor and Clara go missing at the mill Madame Vastra, Jenny, and Strax are informed of the strange goings on at Sweetvill. 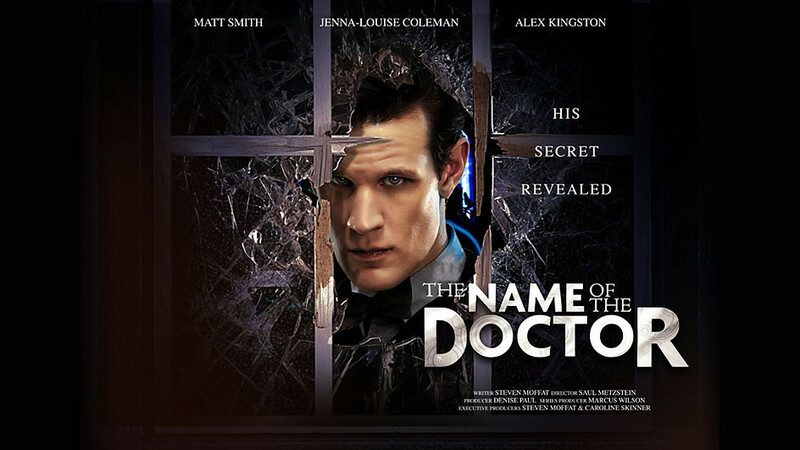 They set out to investigate, with Jenny infiltrating the shadowy building, where she finds the Doctor locked in a room. 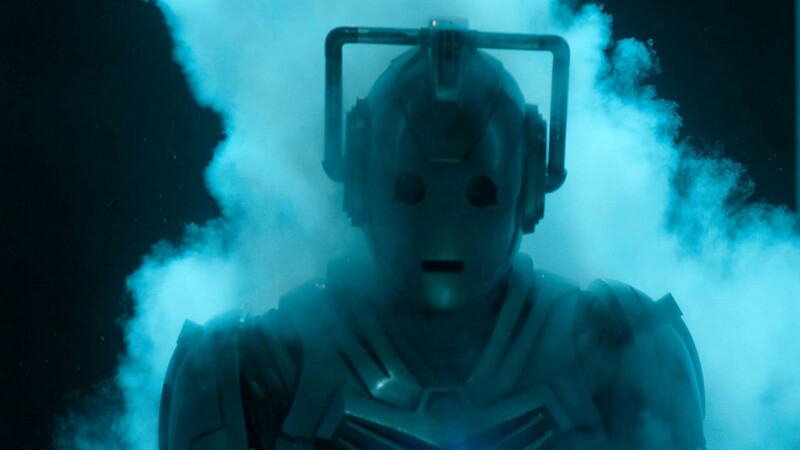 After being captured by Mrs Gillyflower, the Doctor was lowered into the steaming vat that houses the Crimson Horror, but because the Doctor is an alien the process fails. 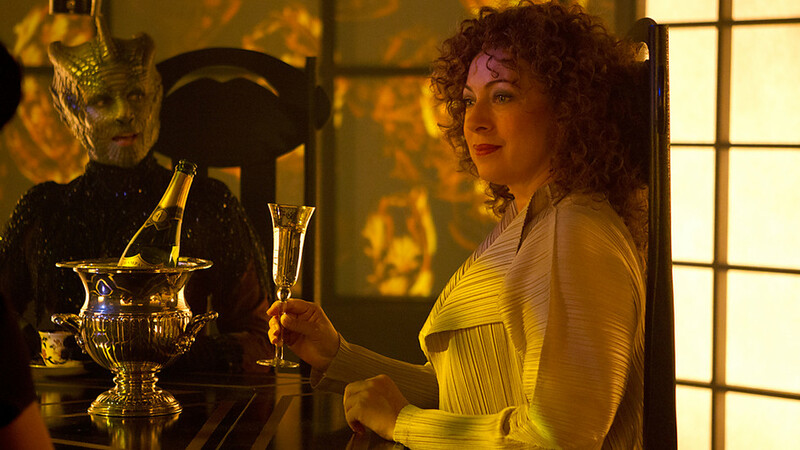 Instead of disposing of his body in the river, Ada took pity on him, and locked him away to keep him for herself. When Jenny finds the Doctor his skin is red and he can hardly move. She helps him reverse the process and rescue Clara, just as Vastra and Strax arrive to fend off Mrs Gillyflower’s henchmen. It transpires that Vastra knows of the Crimson Horror, she informs the Doctor that it is really the venom of a prehistoric parasite which once affected her own race, the Silurians. The parasite is really Mr Sweet, a slug-like creature that has bonded itself symbiotically to Mrs Gillyflower’s body. She has been milking its venom so she can launch it from a rocket inside the mills chimney stack. The Doctor and his friends must stop Mrs Gillyflower from launching the rocket, or the entire world will be poisoned by the Crimson Horror. This story by Mark Gatiss features the welcome return of Madame Vastra, Jenny, and the Sontaran Strax. 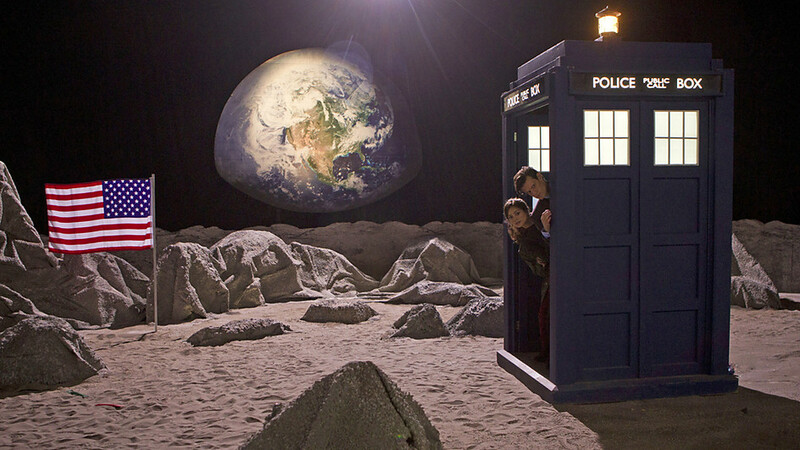 These characters became fan favourites after they banded together to help The Doctor and Rory rescue Amy Pond from Madame Kovarian’s base on Demon’s Run in A Good Man Goes To War (2011), and they returned to help the Doctor and Clara (The Governess) fight the Great Intelligence in the 2012 Christmas Special: The Snowmen. It’s great to see the Silurian Detective Madame Vastra and her loyal companion Jenny solving mysteries again, while Strax is as hilarious as ever and together they make a brilliant team as they explore the Sweetvill Mill. 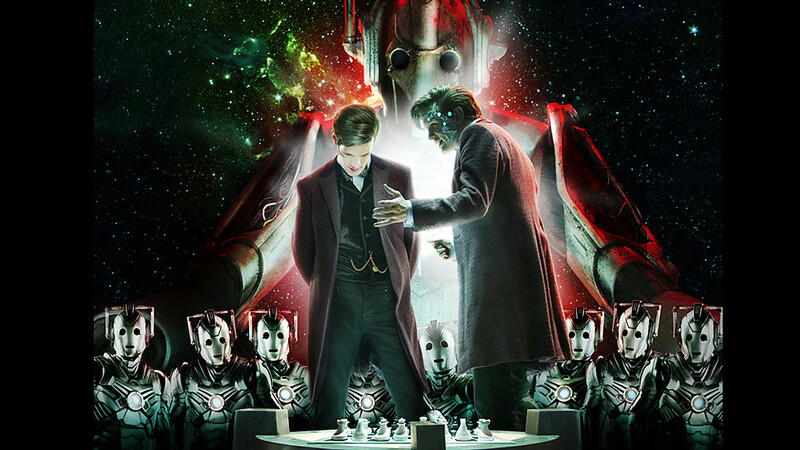 The Crimson Horror is a comparatively Doctor-Lite episode, with the Time Lord and Clara not really featuring much until the midway point of the story. 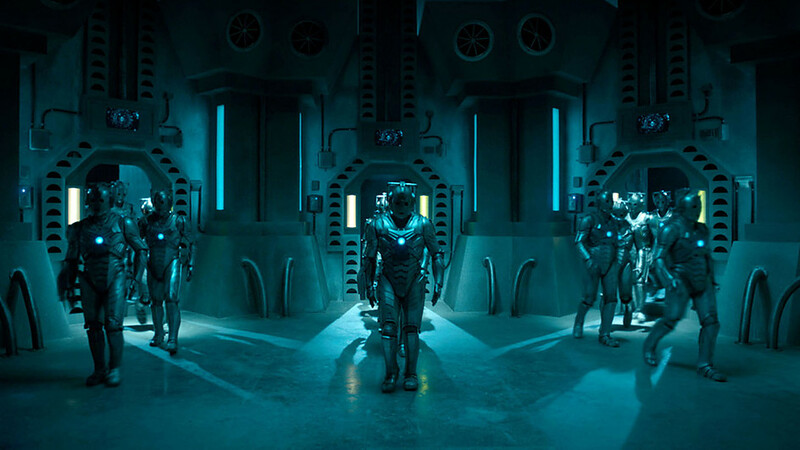 Instead we discover what is happening in Sweetvill as Vastra, Jenny and Strax carry out their own investigation as they attempt to rescue the Doctor and Clara from the mill. 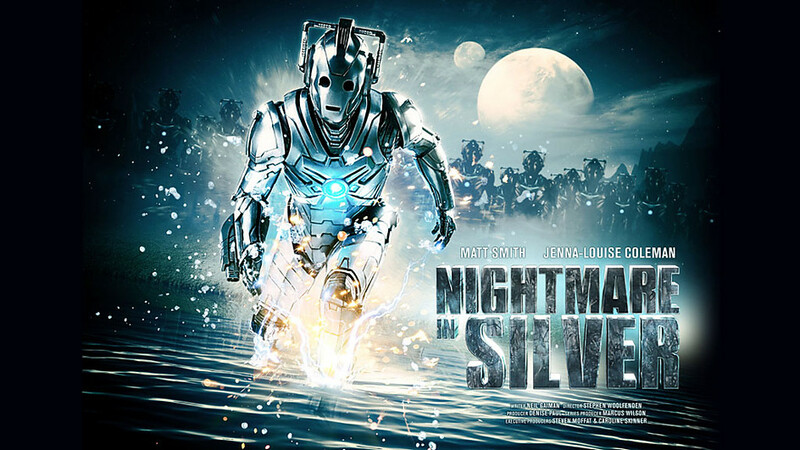 Neve McLntosh gives a sublime performance as the Silurian detective, Catrin Stewart plays a pivotal role in the action as Jenny, and Dan Starkey is absolutely hilarious as Strax. 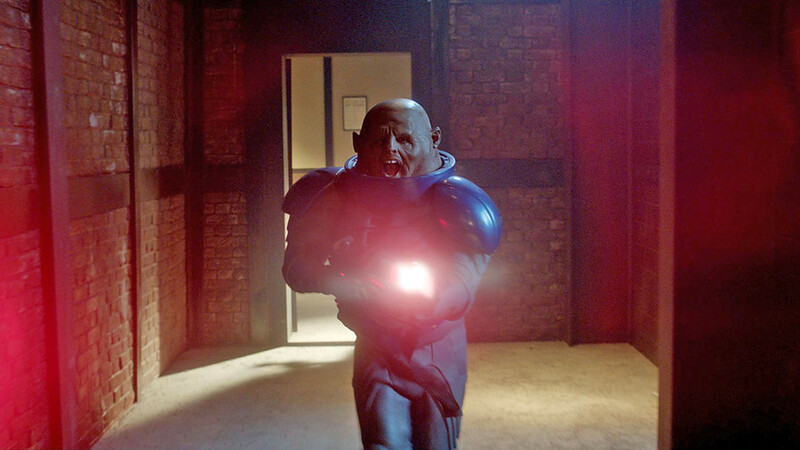 The banter between Vastra, Jenny and Strax is really good, with the Sontaran getting all the best lines. This trio of characters work brilliantly together, at times this episode almost feels like a pilot for their own spin-off series. Indeed, if the onscreen camaraderie between Vastra and her friends in The Crimson Horror is anything to go by, then as spin-off featuring Vastra, Jenny, and Strax solving mysteries and fighting strange alien menaces in Victorian England would be an absolute delight. 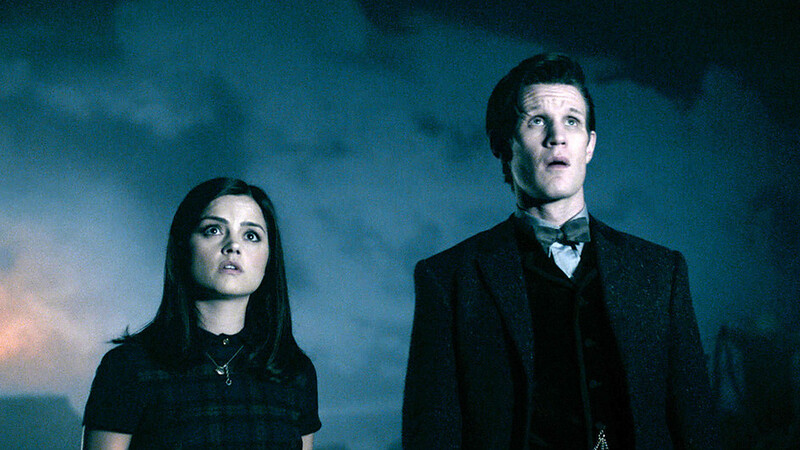 Matt Smith and Jenna-Louise Coleman are really settling into their roles now. 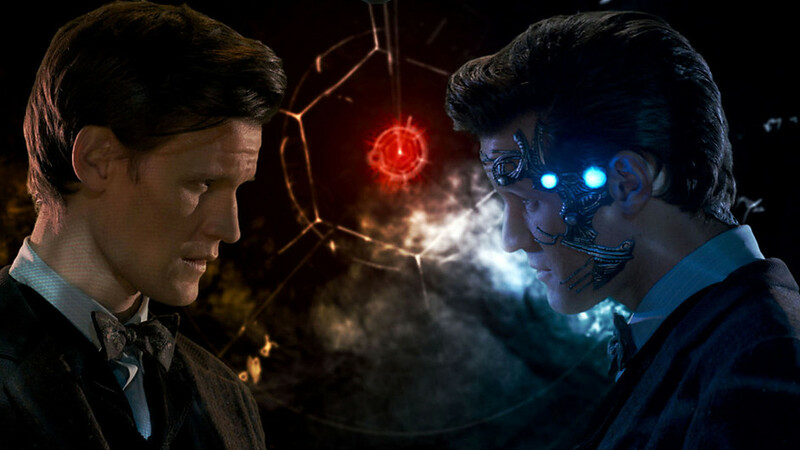 The relationship between the Doctor and Clara is really starting to evolve into something very special, they seem to share a unique bond, and this episode really highlights just what a good team they make. 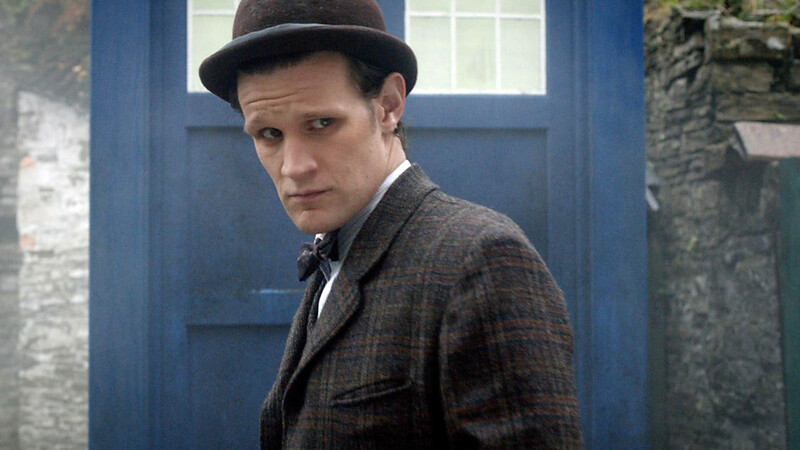 With the Doctor wearing a new variation of his costume, sporting a bowler hat, and with Clara dressed in a Victorian outfit reminiscent of the one she wore as the Governess in The Snowmen, their initial role in the story is told mainly through a series of grainy old film-style flashbacks. 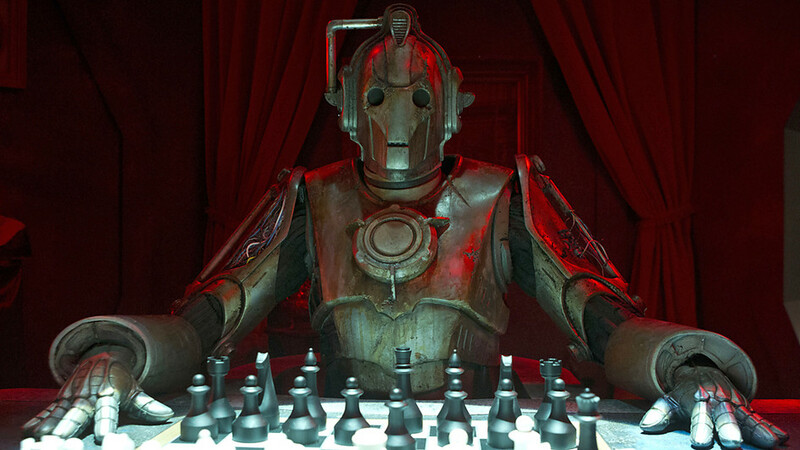 There is also a nice reference back to one of the Doctor’s pervious companions, Tegan (Janet Fielding), who travelled with the 5th Doctor (Peter Davison), when the 11th Doctor talks about Tegan and says to Clara: “Brave heart Clara.” It’s these nice little touches that have really made the second half of the season so special. The Crimson Horror also has some fantastic guest stars, with Diana Rigg and her daughter Rachel Stirling appearing on screen together here for the first time ever. 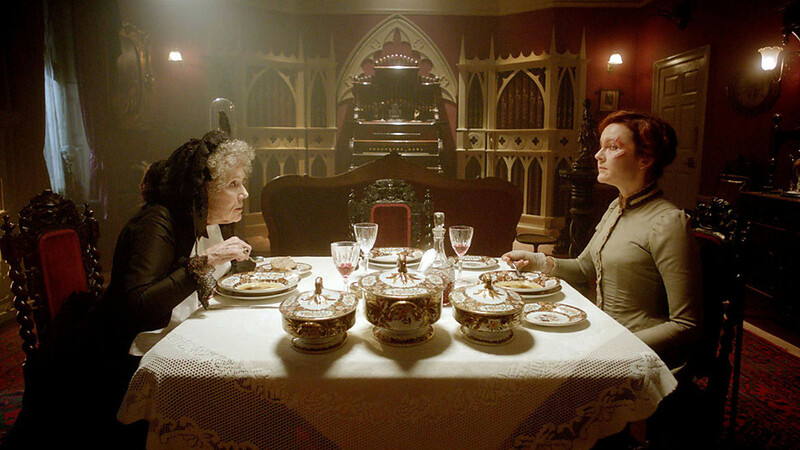 Incidentally they play mother and daughter as well in The Crimson Horror, with Diana Rigg as the wickedly evil Mrs Gillyflower, the owner of Sweetvill Mill, and Rachel Stirling as Ada, her poor daughter – who was blinded by her mothers cruel experiments. 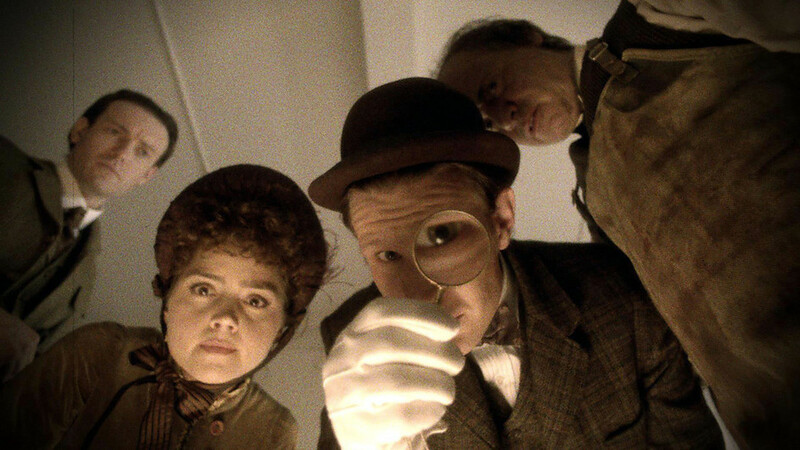 Mark Gatiss’ wonderful script really plays to their strengths, they have some fantastic scenes together, particularly when the truth about Mr Sweet is revealed, and it’s a joy to see Matt Smith and Diana Rigg working together in this episode. 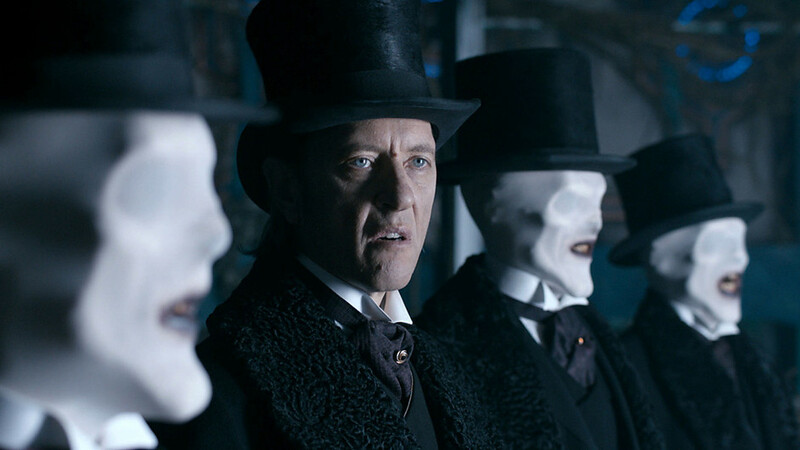 After his fabulous work on The Snowmen, director Saul Metzstein returns to bring the same distinctive gothic atmosphere to The Crimson Horror as he did with the 2012 Christmas Special, having also directed Dinosaurs on a Spaceship and A Town Called Mercy for first half of the seventh season. The attention to the period detail is as impeccable as we have come to expect, as are the costumes, and the blood red venom being created in the mill is a really sinister concept. I like how the deadly wax-like venom turns people into Mrs Gillyflower’s slaves, it’s quite horrific to see the Doctor infected as well, although the parasite creature is strangely cute for something so disgusting. 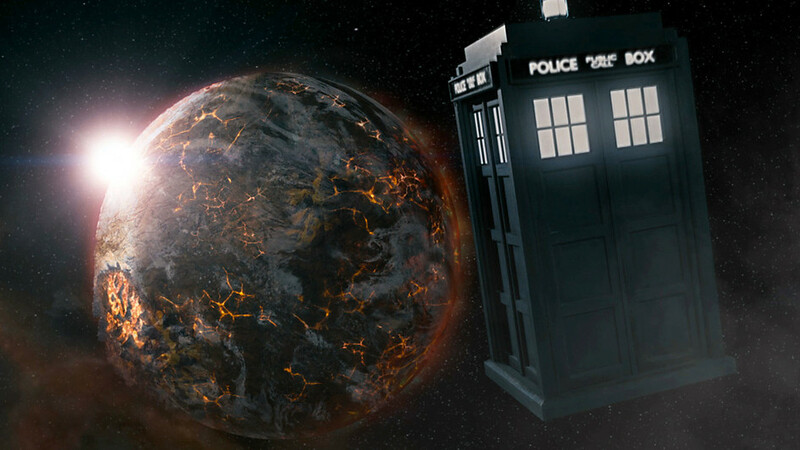 This episode also marks something of a landmark for Doctor Who, as it is the 100th episode to be shown since it returned to our screens in 2005. So far Mark Gatiss has written six stories for Doctor Who, and I think his contributions to Season Seven have been some of his best episodes so far. The Crimson Hand is a good old fashioned mystery, with the Doctor’s images captured uncannily in a dead man’s eye, a laboratory full of bubbling test tubes, some brilliant action for the Paternoster Row gang, and a thoroughly macabre sense of fun with plenty of horror clichés thrown in for good measure. 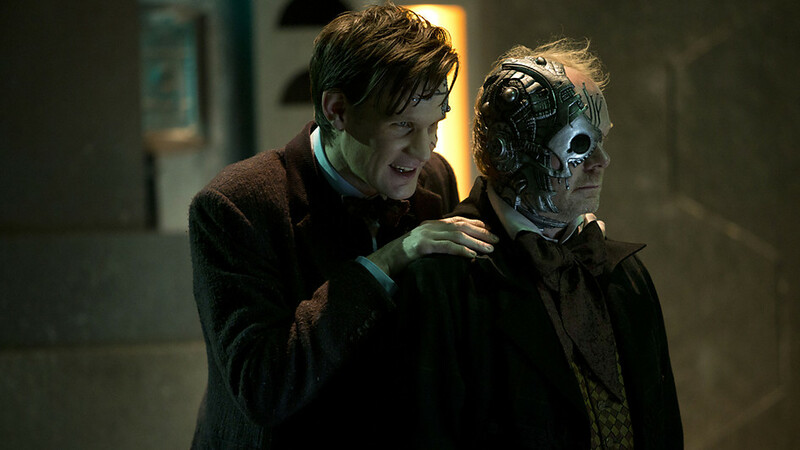 The scene with the young street urchin called Thomas Thomas, who gave Strax some very precise directions to the mill, was a really neat twist on Sat Nav by Mark Gatiss. 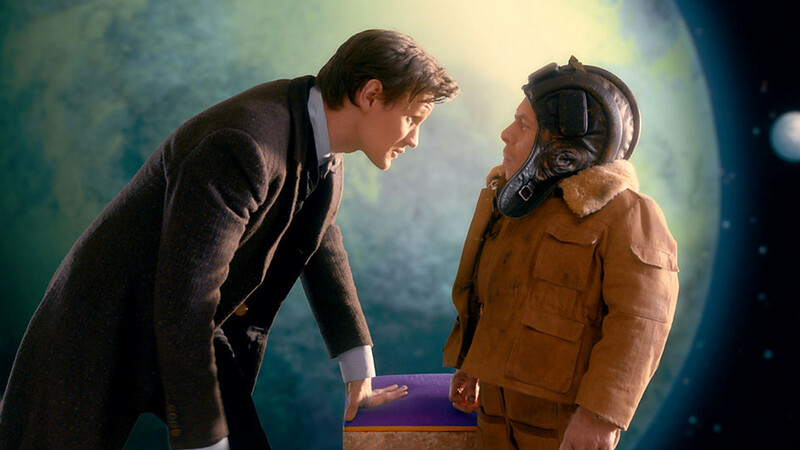 There are some nice references back to The Snowmen as well, especially as the Doctor tries to explain how Clara is still alive to Vastra and Jenny, and a funny closing scene where Clara realises that the children she looks after have found out that her secret “boyfriend” is really a time traveller. 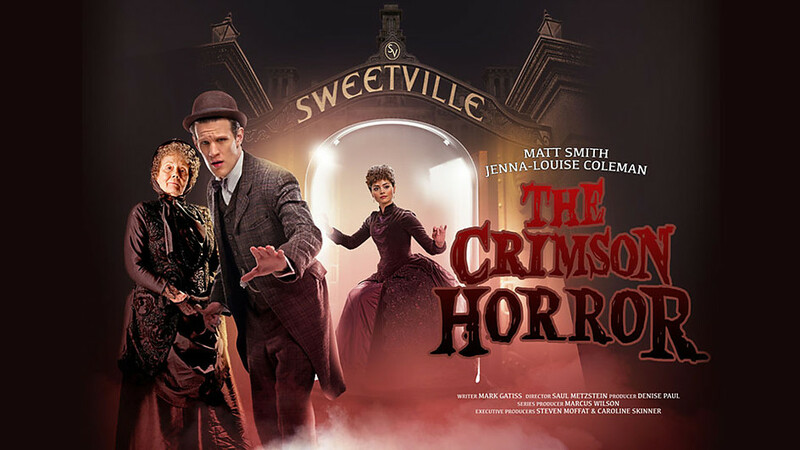 The Crimson Horror is another great episode by Mark Gatiss, it’s full of dark humour and cheeky double entendres, and it’s great to see the Doctor working with Vastra, Jenny and Strax again. The plot involving Mrs Gillyflower and her bonneted assistants as they ensnare their unwitting workforce in their scheme is really chilling, transforming them into her mindless puppets, so she can launch a rocket full of the red venom and infect the entire world with the Crimson Horror. 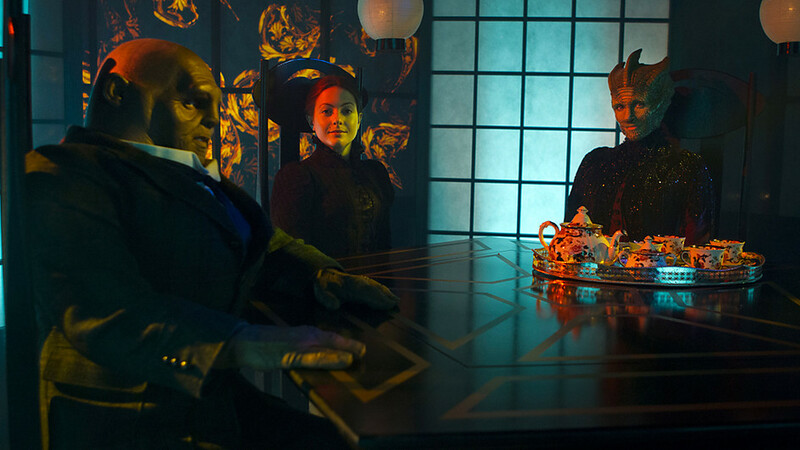 The period setting is a bizarre amalgamation of steam punk and fantasy, with some foreboding gothic undertones, that work together with the terrific ensemble cast to make The Crimson Horror one of the most entertaining – if slightly silly – stories of the seventh season. Earth 2 #12 sees the war of magic between Doctor Fate and Wotan spilling out from the Realm of Nabu and back to Earth, where the battle continues to rage in the skies over Boston as Flash and Green Lantern team up to help. The World Army have mobilised their aerial teams to contain the conflict, but Green Lantern and The Flash stop them from interfering, giving Khalid Ben Hussain the chance he needs to adapt to his new powers as Doctor Fate. With the spirit of Nabu to guide him, Doctor Fate takes the fight to Wotan, using the ancient powers of the Gods at his command to confront Wotan in a duel of hexes and spells. 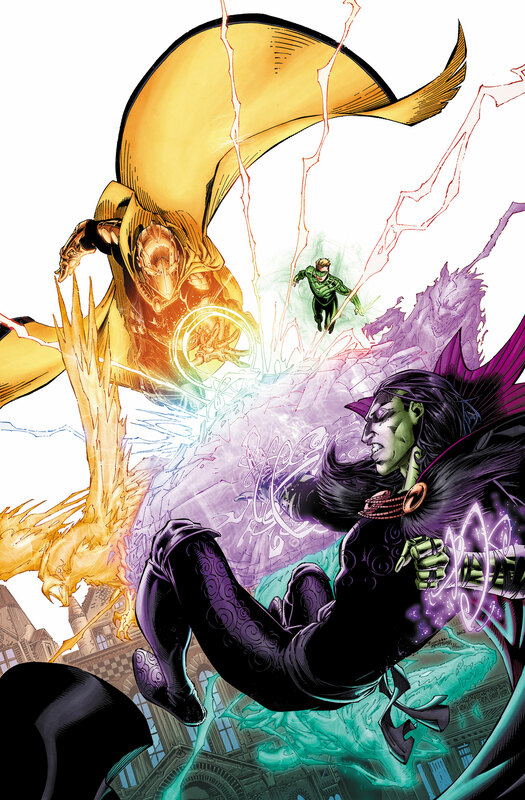 James Robinson delivers another first class issue of Earth 2, opening with the incredible aerial battle between Doctor Fate and Wotan, before utilizing a flashback to show what happened just after Doctor Fate saved the Flash from the Great Beast inside The Tower of Fate at the end of the last issue. Here we are treated to some great scenes between the Flash and Doctor Fate, where Khalid thanks Jay for inspiring him to become a hero, even though Khalid knows that sharing his consciousness with Nabu could cost him his sanity. Doctor Fate also helps Jay Garrick draw on the power within his own subconscious to repair his shredded costume, which gives James Robinson a chance to introduce a slight redesign of Flash’s costume. Wotan is waiting outside the Tower of Fate for them with his hostage, Jay’s mother, and is completely unprepared for Doctor Fate’s attack. The spirit of Nabu urges Khalid not to be rash or proud, calling on him to be his chosen champion, and evoke the power of the Gods to open a portal back to Earth where his powers will be stronger than Wotan’s. As the battle crossed back over to Earth 2, the Flash carries his mother and races back through the portal as well. Over in Macau, in China, Green Lantern is investigating the murder of his lover, Sam, and has asked Hawkgirl to help him. Following up on a lead from Mob Boss Eddie Kai Lung, Green Lantern and Hawkgirl examine a container at the docks, only to discover that it is full of rotting Parademon corpses from the Apokolips War. The mystical green energy within Alan Scott suddenly tells him that he must return to America, so he leaves Kendra to continue the investigation alone. 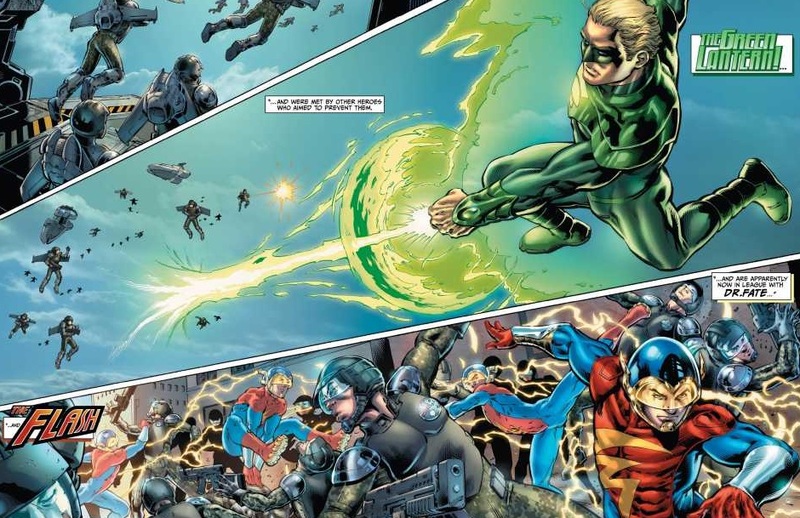 Despite her protests, Green Lantern says he has no choice but to go where the green energy commands, he asks Hawkgirl to continue the investigation alone while he returns to the states, where he arrives in in time to help the Flash keep the World Army forces at bay while Doctor Fate battles against Wotan. 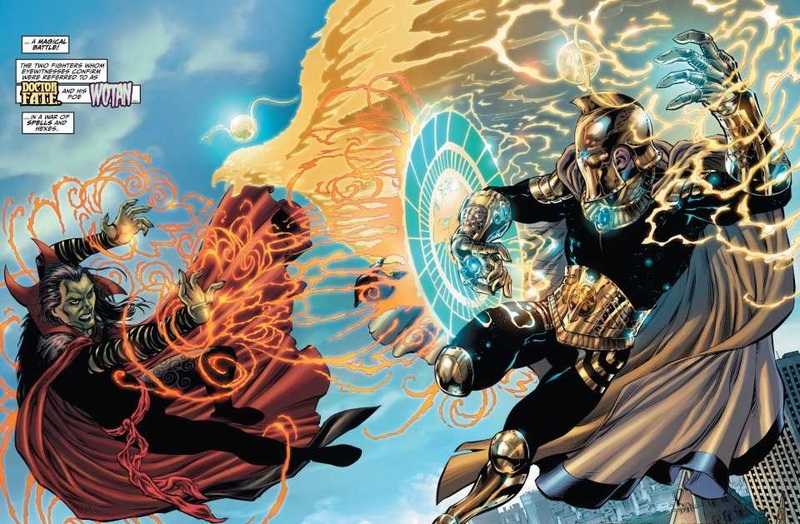 Khalid uses his knowledge of the Gods of Old to great effect as Doctor Fate, combining the transformation powers of Set with the metal working energies of Ptah to ensnare Wotan, before attacking the Dark Mage with the fiery power of the Goddess Menhit and banishing him to the another dimension with the wrath of Horus, God of War. The New Wonders of Earth 2 regroup at GBC’s company headquarters, Alan Scott’s home in New York City, where he suggests they use his company to create some positive publicity so they will be accepted by the public. However, as Jay’s mother points out, Alan Scott still has his secret identity, its not so easy for her and Jay as people know who they are, and recent events have left them both wanted fugitives by the government. While they decide what to do, Alan offers them the guest quarters below his apartment, but Doctor Fate has a vision as tells them to switch on the television. The breaking news report details how Steppenwolf has been seen in Dherain, where he now rules, and that the World Army has just declared war on the country. To say that Earth 2 #12 is epic is something of an understatement, as writer James Robinson ramps up the action, with the battle between Doctor Fate and Wotan returning to Earth where they duel with magic above the city. Nicola Scott’s stunning artwork captures every aspect of this thrilling confrontation in incredible detail, along with Trevor Scott’s impeccable inks, and the rich colours of Barbara Ciardo and Peter Pantazis. Its fascinating to see how Doctor Fate’s powers work, the duality of his shared existence with the spirit of Nabu is perfectly portrayed, and each of the Egyptian God’s spells he calls upon offer a limitless wealth of potential for the character. I also like how Nicola Scott puts so much detail into Fate’s costume, particularly the reflections and symbols on the Helm of Fate. The origin of Doctor Fate has been one of the most exciting storylines so far in Earth 2, writer James Robinson has remained entirely faithful to the character, and this spectacular issue showcases many of Doctor Fate‘s mystical abilities. I really like how we also get to learn more about what has happened on Earth 2 over the last five years in this issue. We already knew how The First Wonders of Earth 2, Superman, Batman, and Wonder Woman lost their lives during the final battle of the Apokolips War. This issue details the aftermath of that conflict in more detail: we hear of fire pits and Parademon Interment Camps, Cyborg Dead Zones, plagues, and perhaps most intriguingly the Living Thunderbolt is mentioned – which could possibly hint towards the existence of another classic golden age character Johnny Thunder and the genie-like Thunderbolt. It’s also interesting to note that the television reporters name is shown as Lee Travis, which is coincidentally the name of The Crimson Avenger, another classic character from the golden age of comics. Whether the mentioning of these two characters are just a nice continuity reference for fans, or an indication of things to come, remains to be seen. But it is this attention to detail by James Robinson that makes Earth 2 such an enjoyable title. The subplot involving Hawkgirl and Green Lantern uncovering the container full of Parademon corpses poses some intriguing questions, and I’m sure Hawkgirl will soon find a connection between this shocking discovery and the identity of who was responsible for Sam’s murder. Earth 2 #12 successfully brings several long running plot strands together that have been developing ever since the first issue. It’s also good to see Green Lantern stepping up to work as part of a team, something he has been reluctant to do up until this point. The World Army now stands on the brink of war with Steppenwolf; we still have the imminent debut of Captain Steel and this alternative Earth’s new Batman to look forward to, and Hawkgirl’s investigation of Sam’s murder. Earth 2 #12 remains one of the best team books around, the art is fantastic, and James Robinson has done a terrific job of reinventing these classic Golden age characters.